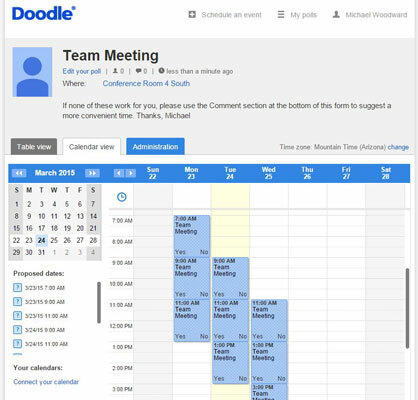 Doodle is a web-based scheduling tool that promises to eliminate the hassle of organizing meetings via email or phone. You set up the meeting details, include however many time options you wish, and invite others via email to respond to the poll. Who hasn’t had that fun experience? You’re trying to find a good time to get together with five people, and 12 rounds of Reply All later, you’re no closer to finding the sweet spot. When you activate a new account, Doodle automatically gives you a free 14-day trial of Doodle Premium. This deluxe version interacts with your existing schedule(s) on Google, Outlook, and other popular calendaring apps, so you can see what you do and don’t have available without flipping between windows and websites. Doodle Premium also enables you to send automatic reminders, request additional information from invitees, and other premium features including MeetMe. It’s free, of course, just long enough to get you hooked; if you don’t pay to keep it going, you’ll likely pout about the niceties you lose without the premium version. Doodle polls are the heart of Doodle and the most compelling reason to sign up. After you have created an account, you can create as many polls as you like and organize as many meetings as you need, all for free. 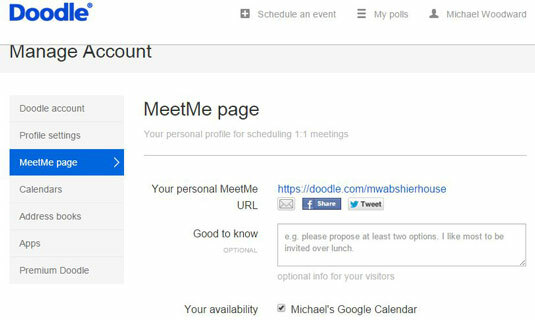 When they eventually do click the link to your Doodle poll, each invitee is presented with a table listing the dates and times that are being considered for the meeting. They can check the box below each date if they’re available or leave it blank if not. Participants can also see what others who responded before them chose. Doodle keeps a running total for you, and as more people respond, it will become clear which option is going to work. Another helpful feature of the premium edition: With a long list of invitees, Doodle makes it easy to tell who has not yet responded to the poll. That way you can nag them but not bother those who dutifully replied. You don’t have to be a meeting attendee to create the poll. Doodle will ask you before it sends the invitations if you want to be a participant, too. Unless the alternative times are pre-determined, everyone is at the mercy of the poll maker when it comes to proposing possible times. People tend to select times that work for them and then give other participants the opportunity to choose one. What happens if you can’t get consensus on any of the times you proposed, but everyone except you is available at a different time? Do you bow out of the meeting, or is it back to the drawing board? Doodle can’t help you with that question, unfortunately — but you can change the email address of the poll administrator, so you can hand off responsibility to someone else. One potential pitfall with the way that Doodle works is that there is only one kind of calendar view. Unlike most of the popular calendaring programs, you can view the Doodle calendar only one week at a time, with a vertical column for each day. If your calendar is crazy, with overlapping appointments and multiple items on one day, the view limitations can be a bit taxing. Sometimes it is better to open your calendar in a separate window anyway, just so it’s easier to tell what’s really happening. MeetMe is a premium feature that helps you set up individual one-on-one meetings with coworkers or friends. Your even get to create your own URL to share with them, such as www.doodle.com/yourname. First, connect your existing calendar(s), so that MeetMe knows what to show as your busy times. Then visitors to your URL can see when you are free and suggest a meeting time that works for them that doesn’t conflict with the appointments in your already busy week. You get the meeting request in your email, and you’ll also see the pending request on your calendar. 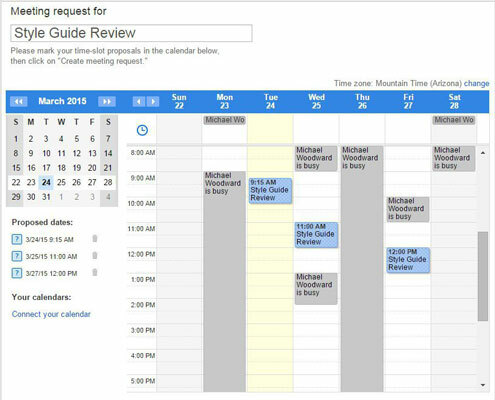 Your personal calendar data is aggregated or summarized, meaning MeetMe visitors can see only your free and busy times, not the details of what you have scheduled. The following screenshot shows the way a calendar looks to someone visiting the MeetMe page in hopes of finding a time to talk to about changes to the style guide. The gray blocks are times the user is in other meetings or away from the office, but the viewer only knows that the user is unavailable. So, the viewer suggested three other meeting times (in blue). 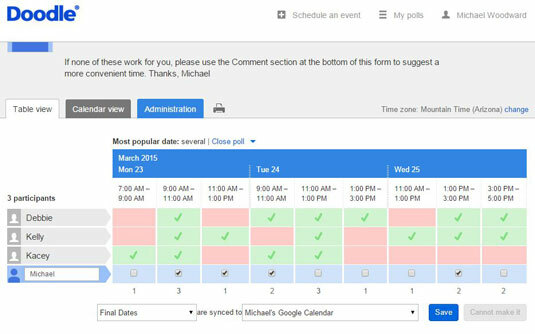 One minor complaint is that you can’t select a time range for a meeting, in a poll or in MeetMe. For example, you can’t say “Let’s meet for an hour any time between noon and 4:00 pm,” without suggesting individual specific start times (1:00? 1:30? 2:15?). If you mark off the entire range, it will look like you want a four-hour meeting. As you can imagine, that gets a bit messy. You can discuss the range option in the description and/or comments area, but who bothers to read that? Fortunately, it’s easy to edit the poll, add new times, and so on, so if you need to shift everything by 30 minutes, you can.